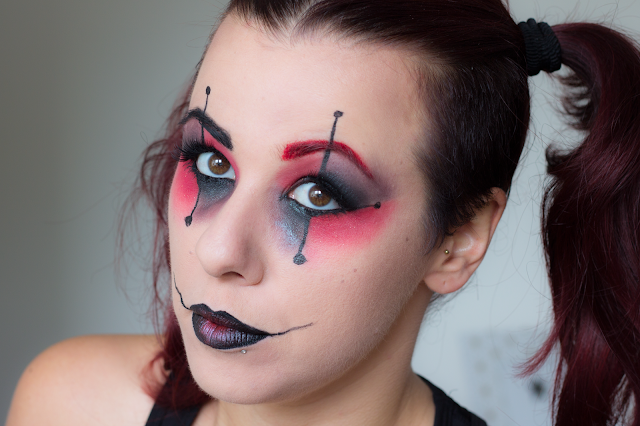 Third episode of the Fall in Love Tag and we’re talking about Halloween of course! 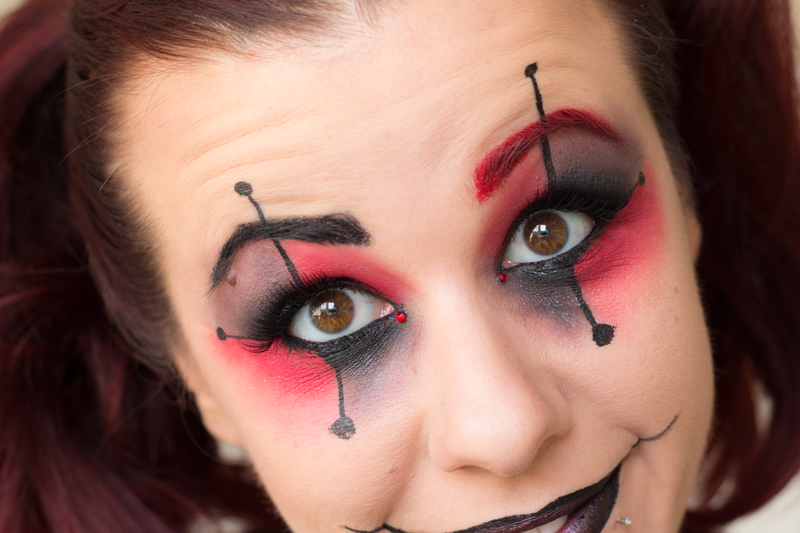 The most fun holiday of the year, at least regarding makeup. It gives me an excuse to wear black lipstick and dark red smokey eyes and release my inner gothic self. In this tag we are asked to describe our Halloween traditions and scary stories, I don’t have anything scary to tell but I have my own little tradition. For the past three years every Halloween I have been on stage with my band Whatever Alice Said, rocking out at the Boekend Rocknight. There isn’t much Halloween-y about it and nobody wears a costume, but the music is good and loud, everyone wears black and it’s a hell of a party! For my own makeup, I am allowed to go all out with dark smokey eyes and dark lipsticks because that’s what I love to wear on stage. I have shown a few modifications of the same look here and here so this year I wanted to attempt something closer to a costume. 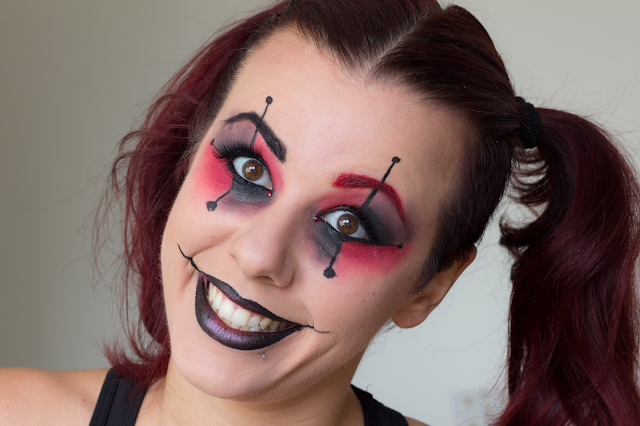 I decided to attempt a Harley Quinn makeup, inspired by the villain in the Batman comics who always had this creepy grin and was good friends with the Joker. 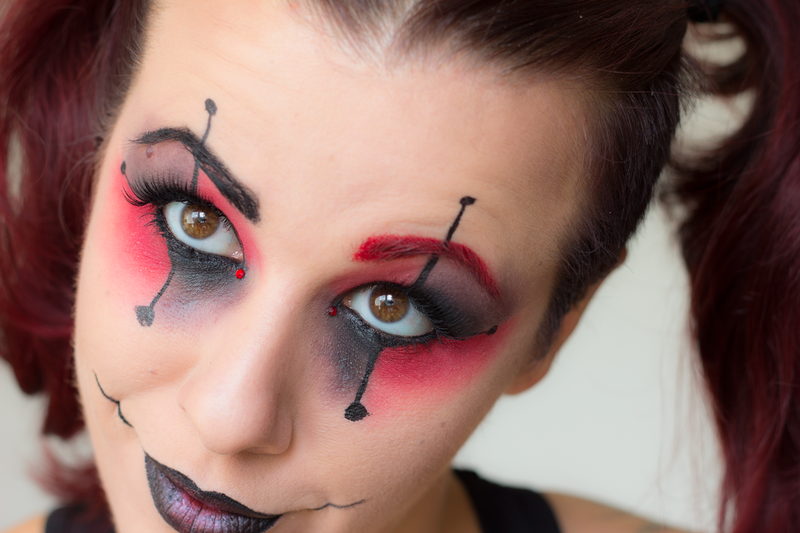 There are many versions of this makeup on the web, but I found this one by Julia Graf and decided to take it as a starting point to then put my own twist to it. 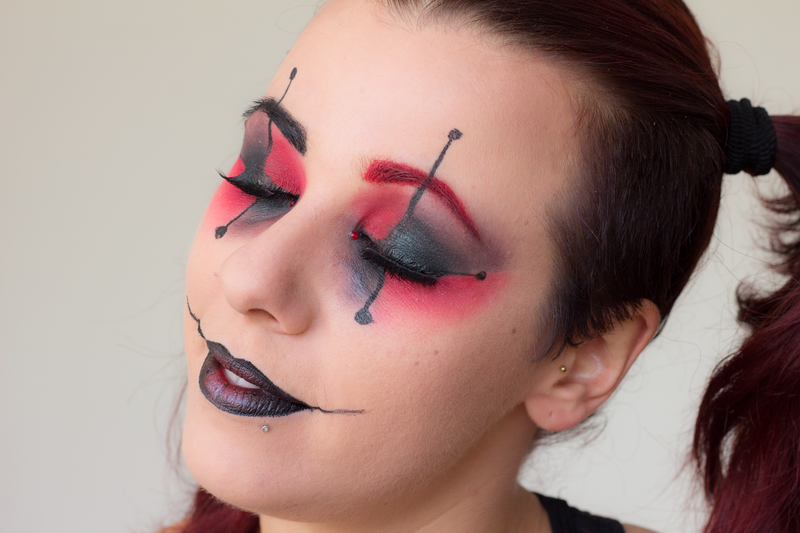 Red and black are my two favorite colors so I knew I wanted to do something absolutely not subtle, because why in the world would one be subtle on Halloween! This look was one of my first real challenges using gel eyeliners (Inglot) as base to deliver a vibrant and saturated color that eyeshadows alone cannot give. I had to work quick before the gel liners set to buff out the edges so I would avoid harsh lines where I want gradients of color. Then I set everything with powder eyeshadow, the black from the Lorac Pro palette and the single shadow Ember from an old LE by Neve Cosmetics, which I was waiting so long to be able to use. Then blending it all out with a dark plum shade (Nabla Mimesis) for the black quadrants. And the lines..oh gosh the lines were a nightmare. With a round face like mine it was a real nightmare to draw straight lines. The best suggestion I can give is to start by outlining the shapes lightly with a black eyeshadow and at the end go over it with a felt tip eyeliner and try to keep it as straight and thin as possible. The least the strokes, the better in this case. Finally I lined the lips with a black pencil, filled them in with a black lipstick (Kiko Cream Lipstick 523) and dabbed some red loose pigment from Essence (anyone remember those? I am so happy I collected them before they were discontinued) in the center of the lips. Then I elongated the side of the mouth with again the same felt tip liner. I hope you liked this look. I sure had a lot of fun doing it and making crazy faces to be in character (I know I’ll never be an actress). In the end I’m going to be my usual (or maybe more dramatic) rock chic on stage for Halloween, maybe that look will come by the blog as well if it turns out nicely. What are you going to dress up as for Halloween? Are you attempting a makeup look?